The extended deadline is a result of changing this Award's cycle from a calendar year to one more aligned with the academic year. The next Award cycle will be Spring 2019 - Spring 2020. 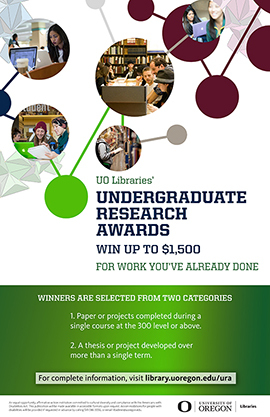 The UO Libraries Undergraduate Research Awards reward students who demonstrate high-quality academic work and excellent library research skills. Paper or project was produced in any term in 2018, winter 2019, or spring 2019. Submissions must have a recommendation submitted online by the course instructor, thesis advisor, or project advisor. Currently enrolled University of Oregon undergraduates or recent graduates only. Single-term projects must be completed for an upper division (300 - 400 level) UO credit course. Theses and multi-term projects must be completed prior to submission and be connected to the UO curriculum. Access is limited to UO students. Use your DuckID to open the application form. Applications are reviewed once a year by the Awards Committee composed of UO librarians and faculty. Currently enrolled students receive awards as scholarships; recent graduates receive a cash award. See Scholars' Bank copyright policy for more information.